The ultimate entry evel compact DJ software controller. The DDJ-WeGO3 is designed with beginners in mind – delivering an intuitive layout and Pulse Control lights to guide you through your performance. Packed with advanced, pro-DJ features, this controller also includes Beat Sync, loops and dedicated buttons for sound effects and samples. Last but not least, it liberates you from the touch screen giving you an authentic mixing and scratching experience. This tactile DJ console lets you mix your favourite Spotify and iTunes tracks held on your iPhone/iPod touch/iPad with Algoriddim djay. 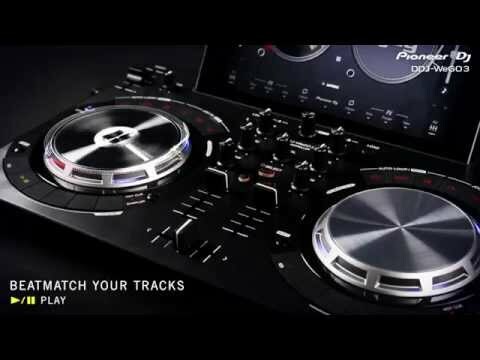 You can use Virtual DJ 8 Limited Edition, Serato DJ Intro or other DJ software, if you prefer to play from a PC or Mac. The DDJ-WeGO3 comes with a durable, stylish aluminium top plate and is available in Black (DDJ-WeGO3-K), White (DDJ-WeGO3-W).and Red (DDJ-WeGO3-R). With only 1.8kg to carry, you could use this controller in the smallest spaces. And, it is lightweight and small enough to fit in a backpack, so you can give spontaneous performances wherever the party takes you. Simply connect DDJ-the WeGO3 to you iPhone, iPod touch, or iPad and mash up tracks straight from iTunes or Spotify. It also charges your i-device while it plays, so you have one less thing to worry about. The DDJ-WeGO3’s LED JOG lights, tell you what's going on, while the buttons and dials are arranged around them for easy access. The Pulse Control lights add a visual element to DJing: they show you when a track has loaded, as well as which effects and filters are engaged.